Goats on the roof! And cabins on the mountain! 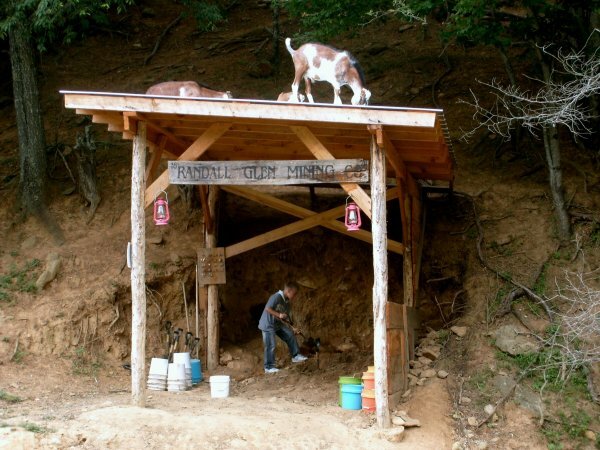 Randall Glen isn’t only a gem mine, we’re a working mountain farm too, and our baby goats spend the summer in the gem mine. The goats don’t just keep you company while you mine, they also do a little tap dancing on the roof. They’re always a big hit with birthday parties here at Randall Glen! And if you’re looking for the perfect gem mining vacation, come stay with us! We have some gorgeous log cabins on our mountainside with all the luxuries including featherbeds and heated towels. Start the day with coffee and a knockout mountain view on the rocking chair front porch. Stroll down to the barn to help feed the chickens and try out milking the cow, then head to the gem mine for some serious treasure hunting. To top off the day, take a mountain trail ride, hike and fish, visit our historic settler’s cabin, then head back to your cabin to relax in your hot tub. Play some billiards or air hockey at the Games Barn, have some barbecue from the farm or make dinner in your lavishly equipped kitchen. Gather at the Games Lawn for a roaring bonfire with S’mores and more stars than you ever saw. Then back to your cabin to luxuriate by the fireplace with satellite TV and your feet up in a comfy recliner. Does it get any better? To get all the details, visit our Luxury Cabin Rentals page (click on the header at the top of this page) or call us at 828-683-5758.